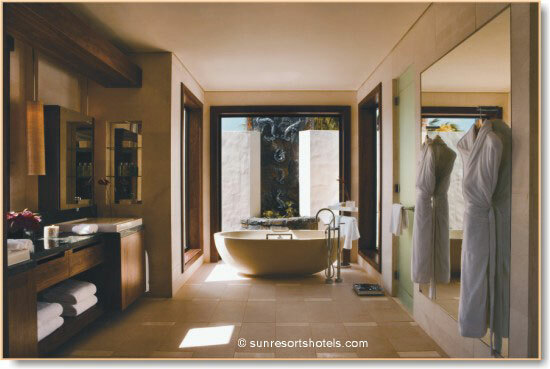 The master bathroom designs featured on this page rank amongst the best when it comes to design, layout and decor. If we had to draw up a wish list for dream bathrooms, these bathrooms would tick just about every box on that list. So, what is it that makes these master bathrooms so beautiful to look at? 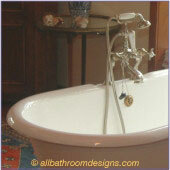 There are no custom designed fixtures or over-the-top finishes that will cost you an arm and a leg. However: It is the way in which all the elements in these bathrooms work so perfectly together. They compliment one another and are in perfect balance in scale, placement and design, creating these tranquil and restful rooms. If your bathroom has access to the outdoors, visually opening it up with huge picture windows or with direct access to the outdoors, adds to both the aesthetics as well as the bathing experience. And of course you could take that one step further - if you have adjoining space in your garden - by extending the bathroom to add an outdoor shower. Granted, having a lot of space to play with makes the layout easier, although there is a danger of ending up with a vast (boring) central space if fixtures are all arranged around the walls. 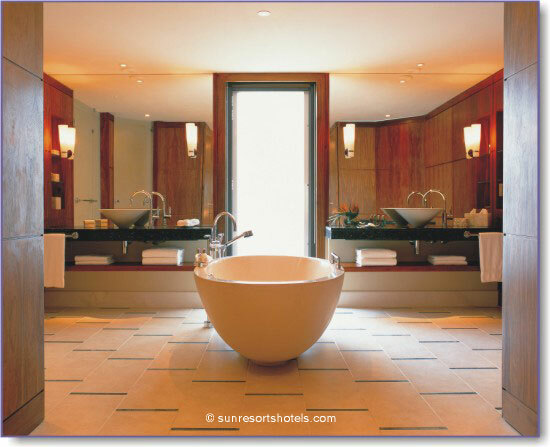 Placing the bath in the center of the room is inspirational. Not only does it create symmetry and a strong focal point, it also cleverly divides this en-suite bathroom into his and hers areas. Enclosed behind frosted glass doors are the shower, toilet and bidet, further ensuring total privacy when a couple are using the bathroom at the same time. Adjoining the bathroom is a beautifully appointed dressing room. 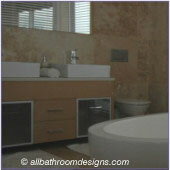 Visit our Master Bathroom Layouts page to help you draw up your wish list. The choice of materials such as marble, granite and wood is rich and sumptuous but uncluttered and streamlined in design - perfect for contemporary master bathroom designs. Huge unframed mirrors add to the simplicity and style. Direct access to the outdoor area extends the space and also adds loads of natural light. 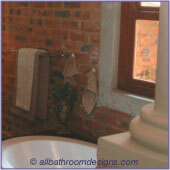 Keeping to a neutral and simple color scheme will always create a timeless elegance in any bathroom. 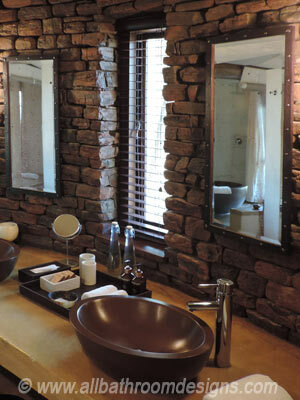 It also makes for a restful and spa-like ambience and a sense of tranquility. Where there are large areas of color - such as the floor tiles - a design solution was found with the inset of either contrasting or harmoniously colored tile insets to break up the space and create visual interest. If the bathroom flows from the bedroom, it is good design practice to ensure the colors are coordinated or matched rather than going off on a totally different tangent for the bathroom decor. PS: We can unreservedly recommend this group of hotels if you are looking for a superb island holiday.